« Why aren’t more women flying? To immerse yourself in the desert be prepared for a surge of unfiltered emotions. You are enchanted, beguiled, seduced, awed, and challenged. This is a land so raw with a whole new set of rules to play by. Kitty and Bob, Don and I had perfect flights down the Central Valley and up and over the Tehachapi’s into desert landscapes. The hills, along our flight, looked like paint cans had been kicked over spilling streams of neon, orange and yellow paint. Purple carpets of lupine, across the Antelope Valley could be seen from 9,500’. Instead of a wx report I wanted to call Flight Watch and give a flower report. We had to fly into Yucca Valley Airport because it is the only one in the area supported by car rentals. Both Enterprise and Hertz are close to the airport and were quick to come and pick us up. Enterprise had a great deal of $10/day for the weekend. The car companies require a Monday morning drop off, which poses a problem for Sunday departures. I arranged with the manager of the airport, Mike Precup, to keep them safe when we departed. Mike was so generous in helping us out with the details. The flying family comes through again! Our motel and base of operations was 29 Palms which is 10 miles east of Yucca Valley and right outside the park. The town is know for its murals that are on many buildings. The area is also home to the 29 Palms Marine Base. Buzz cut hairdos are the style du jour. The base is the largest Marine base since so many of our military efforts are in desert environments. Our May fly out to the Yucca Valley was timed perfectly for the long protracted winter. Not only were we in dire need of sun, dryness and heat but the desert was so appreciative of the good, long, soak. The wet winters are rare and when they come the desert explodes in waves of color and bloom. Joshua Tree National Park spans the ridge that separates the Yucca Valley from the Coachella Valley. The hustle of Palm Springs does not cross the county line. 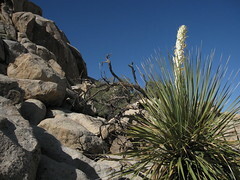 If Palm Springs is known for their rhinestones, the bling of Joshua Tree National Park are the jewel tones of flowers and blossoms on yucca and trees. The trees are crazy, Dr. Seuss-like characters that are giant members of the lily family. You scratch your head and wonder how nature ever came up with that design. Friday evening we took off for some rock scrambling and photography in the park. It’s the loveliest time of day when a golden, silky light infuses the air. 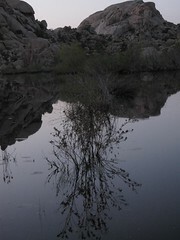 The Joshua Trees cast spiky shadows on rock walls as the sun got lower in the sky. You can’t help but just jump out of the car and start bouldering around. The rocks are made for climbing. After playing in Fred Flintstone land we drove to a trailhead that leads to one of the few lakes in the park. These ‘tanks’ are remnants of the cattle culture when ranchers in the 1800s would dam up creeks for their livestock. Domestic antelope are long gone and in their place the water attracts wildlife of the Mojave. Animals of the desert live on a nocturnal clock because the days can be so intolerable. As evening descended and the twilight sky caught the last vestiges of light, the dulcet calls of birds and chorus of frogs guilded the waters of the lake. What magic to be here, when each heart beat could be felt, in the desert’s transcendent state. 29 Palms has surprisingly great restaurants for such a remote outpost. We all grabbed a late bite to eat and headed back to the motel for welcome pillows. Saturday morning, up and out early, on our photography safari. I now know, why Moses wandered, lost, around the desert for 40 years. It’s so easy to just keep going, meandering in random circles, following flower lined water courses and tracking the foot prints of the previous night’s activity. Later Sat. morning we hooked up with a ranger led hike into 49 Palm Canyon. Our guide was a wealth of information on geology, history, botany and biology. The desert is such a subtle place that it takes a long time to really understand the layers of life. You need to stop the moving and just soak up the energy. The 49 palms form an idyllic oasis, 3 miles from the trailhead. There are two desert tortoises that live along the trail and are seen frequently. Their habitat is just a square mile. Unfortunately for us they must have been off on a siesta deep in the shade. After all the hiking and heat we agreed it was time for naps and relaxing around the pool. I’m studying for my Commercial rating. The books were glad to get out of the suitcase. Don and I took a tour of the murals of 29 Palms prior to dinner. Some really talented artists have created a really, cool thing. The Oasis of Mara is the site of 29 Palms Inn and Spa. We shared excellent food, music and ambiance around the star lit pool. Sunday morning gave us a last chance to photograph this unique and beautiful park. By now we’re off in 3 different directions like a bag of dropped marbles. Digital cameras make the image making so much fun. Between 4 cameras we have enough pictures to make a book.